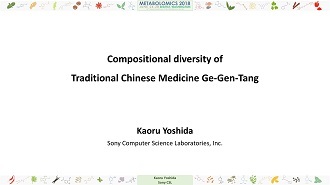 Oral presentation at Metabolomics 2018 | | Sony Computer Science Laboratories, Inc.
Kaoru Yoshida gave an oral presentation titled “Compositional diversity of Traditional Chinese Medicine Ge-Gen-Tang” at the 14th Annual Conference of the Metabolomics (Metabolomics 2018) held in Seattle, WA, U.S.A., June 24-28, 2018 (http://metabolomics2018.org). Keynote address at 12th IFDC.Keynote address at 12th IFDC. Poster presentation at 12th IFDC.Poster presentation at 12th IFDC. Poster presentation at 3rd IMEKOFOODS.Poster presentation at 3rd IMEKOFOODS.